Is Square Inc. a Buy? 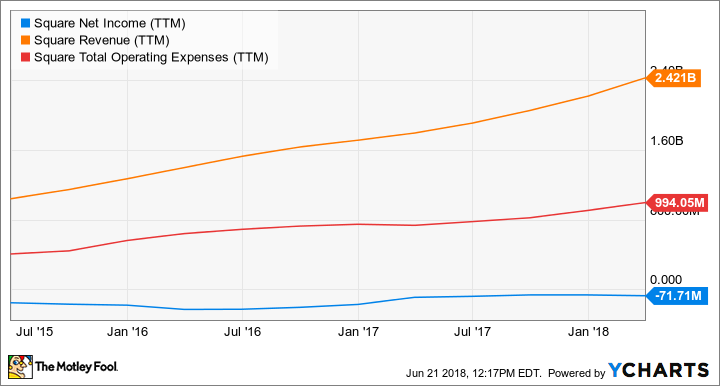 The electronic payment and merchant services company is still growing like crazy, but will it ever make enough money to justify its lofty share price? Electronic payment company Square Inc. (NYSE:SQ) has been one of the hottest stocks on the market in the past year, up 185% as of this writing. This is despite the company having lost $72 million over the past year, so investors must think its future is bright. What has gone right for Square, and can its share price run continue? Let's dig into the numbers, and attempt to explain why investors like this payment company so much. At a high level, it's plain to see that Square is a company in growth mode that's struggling to make money. Sometimes, revenue growth is enough to keep a company's stock moving higher, but there are some good reasons to think its bottom line will improve in the future. Transaction-based profit as a percentage of gross payment volume is up from 1.04% in the second quarter of 2017 to 1.09% in Q1 2018. That may seem like an extremely small improvement, but this is a key metric for investors to watch. The more profit Square can squeeze from every purchase made via its platform, the closer it gets to being in the black. Now, costs are a challenge. If management can start holding operating costs steady, the company could become very profitable in the long term. But there's a good reason management may continue spending to expand the business. What differentiates Square in the market are its simple, flat pricing model and its broad range of services. Most companies in its space focus narrowly on point of sale systems (POS). Some may also offer services like customer management or reservation systems, but those offerings are generally limited. As a result, businesses who use them must stitch together as many as a dozen other systems like payroll, accounting, scheduling and inventory from multiple providers. Square's genius has been putting most of the important systems companies need under one roof. Appointments, e-commerce, scheduling, and over a dozen other services are offered by Square to customers. It does charge fees for them, over and above the percentage of each transaction it takes for using its POS, but they all integrate easily, making it easier to run a small business. These additional services are driving Square's growth, but they cost money to build out. That's why you see costs rising in the chart above, and also why investors aren't terribly worried about the trend. As long as revenues are rising at the same time, it shows that the company is building a valuable ecosystem of services its customers are ready to pay for. How stable is Square's position? Whether you're starting a food truck or a salon, Square's the go-to POS for small businesses. But it's not as if their clients can't switch POS systems, and there's a risk Square isn't keeping up with new tech options. While I like Square's ecosystem and its growth, I also see competition coming. According to CB Insights, nearly $2.5 billion was invested in restaurant tech (POS, scheduling, accounting, etc) alone between 2012 and 2017. The company also says there are over 150 start-ups building tech for retail stores. Food and retail are Square's bread and butter, and that's a lot of hungry competition coming for its business. That's why I'm hesitant to buy Square today. In fact, given the stock's run higher over the past year, the company's $27 billion market cap, and the fact that Square is still losing money, I'm ending my profitable CAPS call on the stock, and looking for better investment opportunities elsewhere.